Born in the Netherlands in 1969, Ewoud De Groot studied at the Kunstacademie Minerva in Gronigen. Whilst growing up in an area between the North Sea and the Waddensea, a large tidal mud flat system between the North of Holland and the south of Denmark, he would go out with his father fishing and collecting mussels. 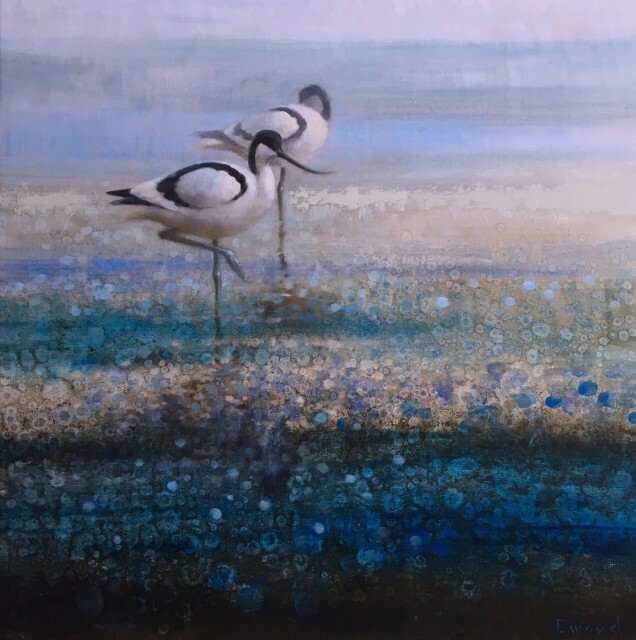 Under the huge skies and out on the open water, Ewoud was impressed and influenced by his surroundings so choosing wading birds as a subject for his paintings and drawings came naturally to him. He paints his subjects in a traditional way, whilst the landscape is more abstract and suggestive, always exploring all the different facets of composition, colour and technique. His method is to build up the layers using cold bluish greys and warm brownish greys, starting with big brush strokes before using a palette knife to develop the composition. He is a member of the Pulchri Studio in The Hague (the most prestigious art society in Holland), the Dutch Society of Marine Artists, Society of Animal Artists and the Artist Society of Bergen. Ewoud exhibits widely in Europe and in the USA, including exhibiting at the Birds in Art Exhibition at the Leigh Yawkey Woodson Art Museum in Wisconsin. He also has work in several corporate collections in Denmark and The Netherlands. Ewoud De Groot now lives and works in the small North Sea village of Egmond aan Zee.